In September, when everyone was freaking out about making room on their phones for the iOS 8 install, I knew exactly what my storage issue was without even having to look at my iPhone’s usage stats: Photos. I never clean out my Camera Roll. I automatically sync my photos with iCloud and Dropbox’s Carousel, so I rarely ever think about my photos once they’ve been snapped and shared. Swipe left to trash, swipe right to keep, and watch your space clear out. It’s never a problem in my day-to-day life, but always a problem when my iPhone gets full—not to mention that I’m probably missing out on a lot of fun photo memories by not organizing them properly. Now, I’m trying harder to clear out the clutter on a regular basis, which is why I think Flic is so great. It’s a new iOS app that helps you sort through your photos and decide what stays and what gets dumped. 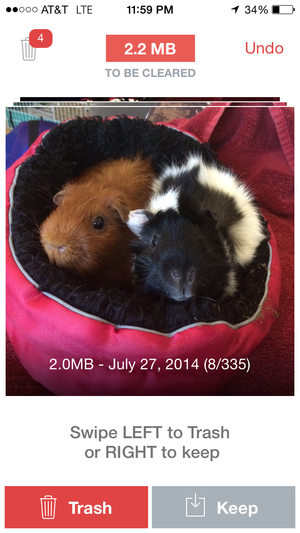 I love how the app handles photo management—it simply asks you whether or not you want to keep that photo. 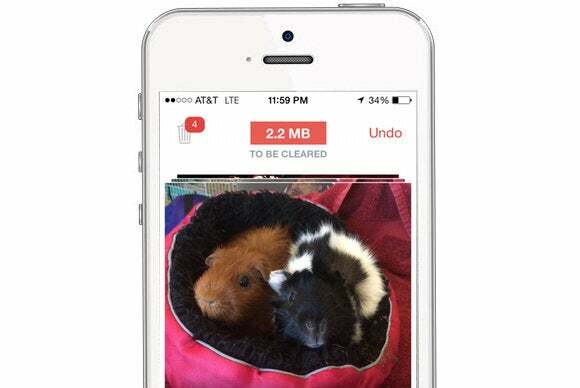 With each photo you dump, Flic tells you how much space you cleared. Each of your “trashed” photos are saved in a special tab and won’t actually be deleted until you approve it, so you can have one last look at that bad selfie and poorly lit brunch shot before you say goodbye. However, you can only go through your photos one calendar month at a time, so you have to wait until next month to review this month’s photos. Also, once you clear out a specific month, you can’t redo that month to pair it down further. I’ve already amassed a bunch of crappy photos and screenshots from October, but now I have to wait until November 1 to use Flic to help me pair them down. I wish I could get to work now. But, photo hoarders can’t be picky, and anything that helps clean up the mess is a winner in my book. Flic is available now in the App Store for $1.